The Holiday season is just around the corner. Planning the perfect Christmas party is a lot of fun but you will also need to deal with various important organisational issues. Choosing the right food and making sure your guests enjoy abundance and copious amounts can make the process stressful. A catered buffet for your Christmas party is one reliable choice that will give you more time to focus on other aspects of party planning. All that you’ll have to figure out is which foods make the most sense for the individuals that will be attending your celebration. We have various suggestions that will appeal to different palates and preferences. The roasted turkey is a Holiday staple that has to be present on your table. At the same time, cooking the perfect deliciously juicy turkey is far from an easy task. Let the professionals handle this process for you and opt for a reputable Singapore caterer. Our roasted turkey breast with cranberry chutney dip follows the traditional recipe with a bit of a twist. If you have a small crowd to feed on Christmas, this is a go-to meal. The turkey’s lean meat goes perfectly well with the sweetness of cranberry. The moisture from the sauce balanced out the relatively dry nature of the meat to create the perfect texture alongside the taste. This is another classic recipe we serve as a part of our Christmas buffet catering. The rosti is an ideal side dish and it’s also a beautiful vegetarian option for those who want to skip the meat this Christmas. The traditional Swiss dish consists of grated potatoes, butter and herbs. It’s a little known fact that the rosti was originally served as a morning dish but the fried potato patty soon turned into a favourite for lunch or dinner. Are you looking for more modern Christmas catering? If so, you may want to choose a catering option that doesn’t involve grilled meat or gravy. A bit of pasta will always come in handy. Depending on the crowd that you’d be entertaining, you’ll have to opt for the right pasta sauce. A classic choice is always safe and it will be a guaranteed crowd pleaser. Pasta algio olio is one such classic choice. The recipe is the simplest one possible, allowing the pasta to be the star of the show. To make things a bit more exciting, we have added mushrooms to the recipe for a bit of additional flavour and texture. We chose fusilli among other pasta varieties because of the helical shapes. These allow the pasta to soak up the sauce beautifully and impact tons of flavour in every single bite. In addition, fusilli are a lot easier to eat than spaghetti during a social gathering. This is another classic to add to the mix. Having at least one salad at your Christmas buffet will provide a healthier choice to those who have already eaten too much (and let’s face it – most of us tend to overeat during the Holiday season). The classic Caesar salad is a good Christmas choice. This salad is a bit more substantial in terms of nutrition and it goes along really well with many other menu items that are typical for a Christmas celebration. We are firm believers in classic recipes, which is why our salad sticks to the tradition. Imagine a delicious crispy romaine lettuce, cherry tomatoes, garlic croutons and parmesan, all topped up with a hearty cheese dressing. This is precisely what we have in store for you if you choose the Eatz Catering Christmas mini buffet. If you’re not going to have a seated arrangement, choose finger foods that are easy to eat while people are socialising, dancing and celebrating. Make sure that your buffet includes at least a few sweet temptations. Give chocolate lovers a choice through the selection of Christmas chocolate brownies and New York cheese cakes. Both of these are dessert staples and both of them are decadent enough for the holiday season. Let’s add yet another sweet deliciousness to the Christmas mix. An éclair is another classic dessert that most people know, recognise and love. With Eatz Catering, you can have Christmas eclairs delivered directly to your party. While they’re beloved and universally accepted, eclairs aren’t that easy to make. As professionals, we know what it takes to give you the crispy pastry and the creamy feeling for a perfectly balanced dessert. Our Christmas buffet catering suggestion consists of 16 white chocolate eclairs. You can find out more about the full menu by taking a look at the Christmas mini buffet menu. Don’t underestimate the importance of traditional drinks for a perfect celebration. Cranberry has long turned into a Christmas staple. It’s added to gravies, sauces and meat glazes. Cranberry drinks also add a refreshing touch to the festivities. Our Christmas Buffet Menu doesn’t ignore beverages and you can choose the Eatz Catering Christmas cranberry drink alongside the meals and desserts. 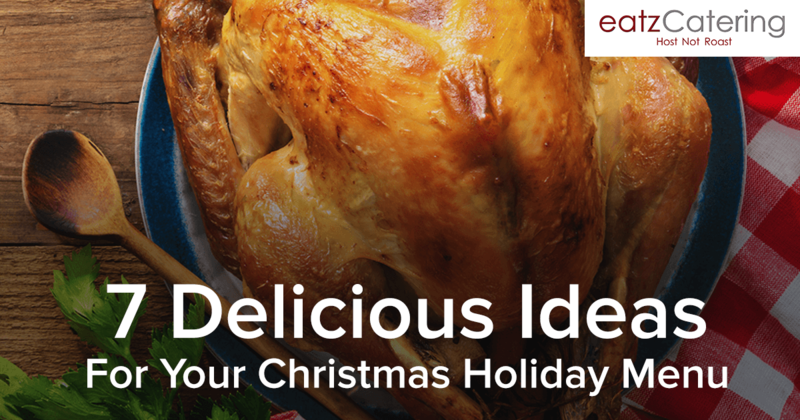 These are just a few of the choices you’ll get to enjoy if you opt for the Eatz Catering Christmas menus this holiday. Eatz Catering is a halal Singapore caterer that offers a wide range of professional solutions. Whether you’re holding a corporate event or a family celebration, you will find the meal choices that are best suited to the occasion. The Christmas season menu offering is available on December 14 and from December 19 to 25, 2018. Non-Christmas menus are available during the same period but a surcharge will apply. From December 19 to January 1, the transport charges will be as following – 35 dollars for the Eatz Catering mini buffets and 60 dollars for the regular buffets. All of the transport charges will be waived for orders exceeding 1,000 dollars. For more information, please take a look at our menu section or contact Eatz Catering today.